I have discovered a) that size 0’s for socks is really cool (love the fabric) and b) clover double points are really quite nice, and pointy like I like ’em. My favourite part of the sock is the heel flap. I love knitting it. The only thing with the size 0 dpns? I still love my Garnstudio circs, and I love that I can just throw magic loop socks in my bag without worry about them as much. The rest of the the wool top I spun up here, all done up in a bulky two-ply. Lovin’ it! They’re pretty big skeins, although I don’t know how much. Finished yarn coming soon! I’ve decided to start some new projects. Isn’t that shiny new project feeling oh-so-good? Well, first up some boy socks. They are grey Fortissima Cottolaua, on 2 mm Clover dpns – I wanted Brittanys, but these were the ones we had at the store and although they are long, they have good points. So it’s all good. These are going fast-ish compared to the two socks at once approach, but we’ll see how I feel about that after the first sock! I also started “Sideways Spencer” from Fall 2004 Interweave, by Annie Modesitt. I’m using Brown Sheep Cotton Fleece in “Olivette”, and it is SO GORGEOUS. The stitch definition! The smoothness! The colour! Colour’s all wrong in this photo (stupid grey day) – it’s a warm olive. I love it. I’m modifying the length by adding an extra pattern repeat and probably more ribbing, as well. So it’s no longer a spencer, but is still beautiful. Oh, and I finished the sari silk scarf. This scarf was less about actually wanting the scarf and more about wanting 1) a fast project and 2) the silk off my shelf. – the zipper for the black cardi has been basted in. it really just needs less than an hour to sew it in and be done – hopefully this weekend sometime. – on wearing the knitted items – ubernatural is a winner, although falls off the shoulders a bit. the skirt is holding up well and is super comfy! 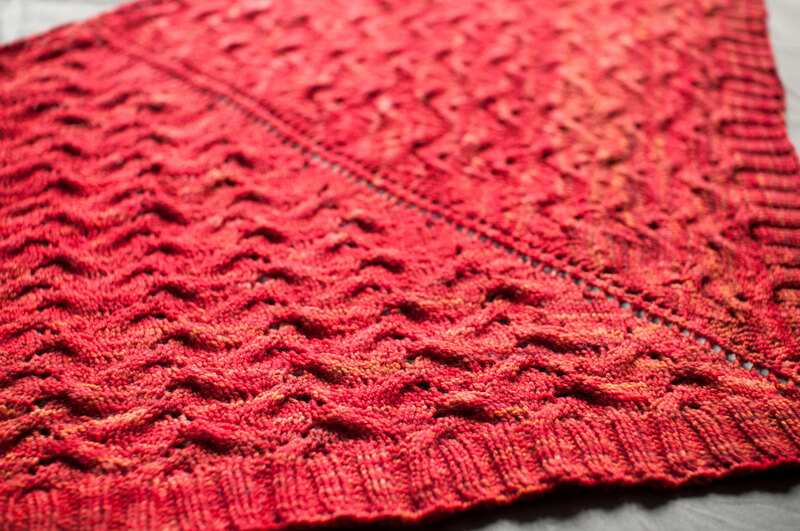 soleil – the neckline *is* a bit low, but otherwise it’s comfy and the length is good. I’m getting sick, it would seem – my sister’s been home all week with a throat thing and now I’m feeling the throat tickle despite sucking down the vitamin C. I hope my dad buys the oregano oil I asked him to – I really can’t afford to get sick, as there is so much schoolwork and things to do!